The League of Extraordinary Writers: Whither Utopia? A couple of weeks ago, Julia mentioned a great bit of history about utopia—the opposite of dystopia. That got me thinking about fictional examples where an author has created an ideal world. They are harder to come by than dystopias. And often what you think is a utopia, turns out to be not so much. For instance, Scott Westerfeld’s UGLIES series starts out sounding utopian (well, sort of) but quickly turns out not to be. Ditto with Lois Lowry's THE GIVER. They're both false utopias. So, what about a genuine utopia in recent science fiction? 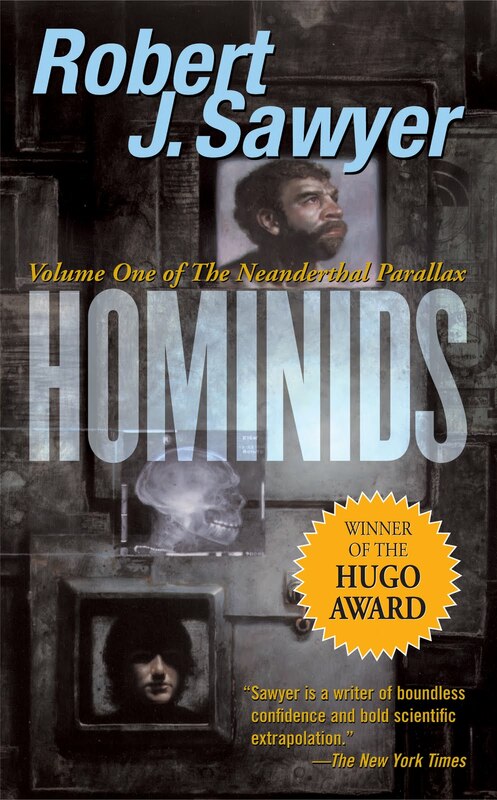 One of the best examples I can think of—at least that I’ve read in the past few years—is the alternate Earth in Robert Sawyer’s HOMINIDS series. (Sawyer, BTW, also wrote FLASH FORWARD, the novel the TV show is based on.) In the first book, present day scientists on our Earth stumble across a dimensional rift created by scientists of the parallel Earth. That Earth has no wars, no famines, no climate crisis. Age is revered, and religion is non-existent. Men and women are equal in all respects. And each adult has two partners—one male, one female. In this parallel universe, Neanderthals inherited the Earth. They became the predominant primate species on the planet. Since there is not much dramatic tension in a perfect world, Sawyer plays our world against the utopian society of the Neanderthals. It does have its faults, and our world has its virtues, but the story comes from this juxtaposition. (Otherwise, a story set solely in utopia might be a little boring.) One of the Neanderthal scientists comes to our world—and falls in love. And what he brings back to his world from ours upsets the balance of his society. What about other utopian fiction, though? Feminist utopias—like Joanna Russ’ FEMALE MAN and Marge Piercy’s WOMAN ON THE EDGE OF TIME—were popular in the 1970’s, but the science fiction genre as a whole hasn’t really favored utopian visions since then—with a few exceptions. Can you guys think of any recent utopian science fiction, particularly in the young adult / middle grade market? If there aren't any, why not? Is it more than lack of dramatic tension? Do we just not believe in the possibilities of Utopia anymore (if we ever did)? Do we think all so-called perfect worlds are highly suspect? Discuss. BTW, Robert Sawyer has written a YA series (WAKE, WATCH, and WONDER), although I don't think they're being marketed as such. I must confess, though, I haven't read them. Have any of you? Would you consider them utopian? Hominids sounds so interesting! I've been meaning to read Flash Forward (since I enjoyed the TV show) so I'll have to add both to my list. I think you're right, though, utopia probably is difficult to write about since we like to stories about conflict. I don't know of any. If society is perfect, what is there to write about? So you'd have to introduce a threat from outside or someone malformed from inside who can't stand how boring and nice it all is. Might actually be fun to do that! I have Hominids on my shelf but have yet to read it. Interesting, but I think you already hit the nail on the head - there's little conflict to be derived from perfection. Unless it isn't so perfect after all, in which case it isn't really a Utopia. No conflict from perfection. I like that, Lisa. From a storytelling perspective, you do need something to create dramatic tension. But, I also thinking, though, maybe we just don't believe in Utopia anymore. Or it's highly suspect to us. We look for its faults. I've read Wake (it was shelved in the regular SF/Fantasy section at B&N, not YA), and it's definitely not a Utopia. It's more of a near-future setting. I thought C.S. 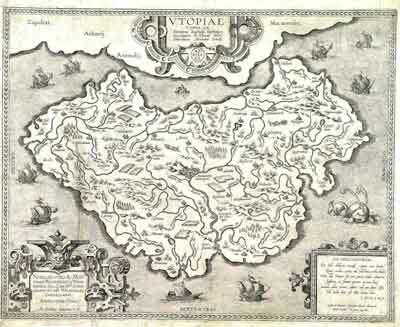 Lewis made the planet in his book Perelandra a pretty good Utopia (for me anyways). He kept the tension going by having the evil from our planet trying to overtake it. Thanks for these posts. The whole dystopian, utopian, steampunk genres used to get me confused but you guys help immensely! Perfect worlds? Definitely suspect because it's subjective and depends on who's making the call of what perfect is. I prefer dystopia. But I think only for pretend. When I thought the bird flu was going to make dystopia real I started praying for utopia. I will have to read Hominids. It could change my mind. Alyssa, I think a Steampunk post is in may near future. Thanks for the Wake scoop, Sandra. 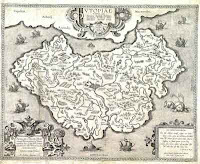 I can't think of anything I'd call a Utopia, since as others have said, that implies a certain lack of conflict. But tv and movies, at least, are full of scifi stories that I am not sure I would classify as either utopia or dystopia. Frex, what would you call Babylon 5, or or Farscape, or Star Wars for that matter? In all of those there are individual societies that have dystopian elements, but I'd say overall the mood is more one of "adventure in space." Personally I'd love to see more of that in YA/MG fiction (though I do also enjoy dystopias!). Hi Deva. I think sci-fi like Babylon 5--which I adored--and Star Wars falls under the sub-genre of space opera. And, I don't mean that in a derogatory way. That's what it's called. It's stories about space travel, adventure, and larger than life characters in the far flung human empire of the future. They're are no utopias because they don't exist. One person's heaven is another person's hell. Not every single person is going to fit the "ideal" of a Utopian society. They're always going to be mis-fits, screw ups, failures, rebels, or people who just don't believe in the party line. There are plenty of dystopias in fiction because there are plenty of dystopic "civilizations" in real life (past and present). eg. North Korea, Somalia, Congo, Darfur etc etc. Both Clarke's Childhood's End and Bear's Blood Music deal with the creation of utopias. However, in both cases the process is apocalyptic. Both novels express the idea that in attaining utopia we must leave our humanity behind - that we are simply too limited in our current form. The realization that an imagined utopia is a false utopia or dystopia in books like Zemyentin's We always pivots on a movement towards humanity. Generally, the main character must come to embrace emotion or individuality or some other quintessentially human trait. So I guess the only difference between a "real" utopia and a "false" utopia is whether or not the author can find a way to view the loss of our humanity optimistically. I didn't know that his new series was a young adult one. I read and loved all of the Hominid books. I would agree that they are as close to a utopian book as you will find. I just think that any utopian book would be boring. I mean seriously who wants to read about a bunch of happy people? What made the Hominid series so great was the tension between their universe and our own. If the whole series had been about set in their universe I would have probably been bored out of my mind.